There are over 1100,000 persons with disabilities in Taiwan. Although they are no different than any of us, they often face numerous obstacles in their everyday lives, including discrimination, low-employment and financial problems. However, despite their physical limitations, they’ve never given up on the exciting possibilities of life. 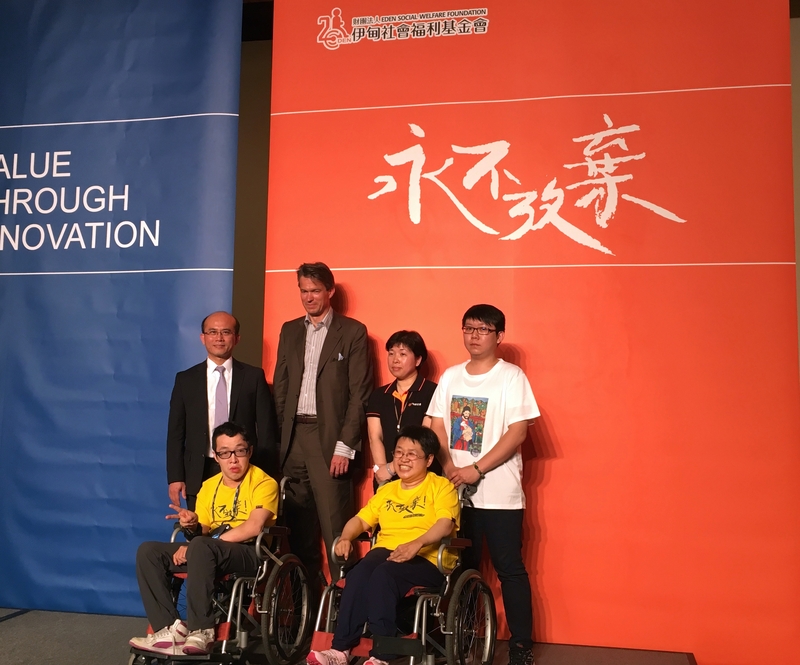 With this inspiring conviction in mind, the German pharmaceutical Boehringer-Ingelheim in Taiwan collaborated with Eden on their VTI Day (Value Through Innovation) to spread the message of never giving up for persons with disabilities. The event was held at Eslite Xinyi in Taipei during their employee meeting and press conference. Over 200 employees were present and two of Eden’s artist with disabilities from Wanfang Center also attended the opening ceremony. The theme of the event was “Never give up.” Through exhibiting artworks featuring the image of a strong fist from artists with disabilities from Eden, they hoped to celebrate the spirit of persistence. The artworks were also made into line art for the 200 employees to fill in the colors. Their finished works were pasted on the 20 meter high wall in the Shin Kong Mitsukoshi Xinyi Plaza and assembled into the words “Never Give Up.” At the same time, a blank space is left on the wall for the public to leave messages to offer encouragement persons with disabilities. Eden’s Wangfang Center is dedicated to providing day-care services for persons with disabilities. Amongst which, there are a number of gifted artists. Although these artists encounter many physical inconveniences in life, and have to work harder than most people, their belief of never giving up helped them through many difficulties. 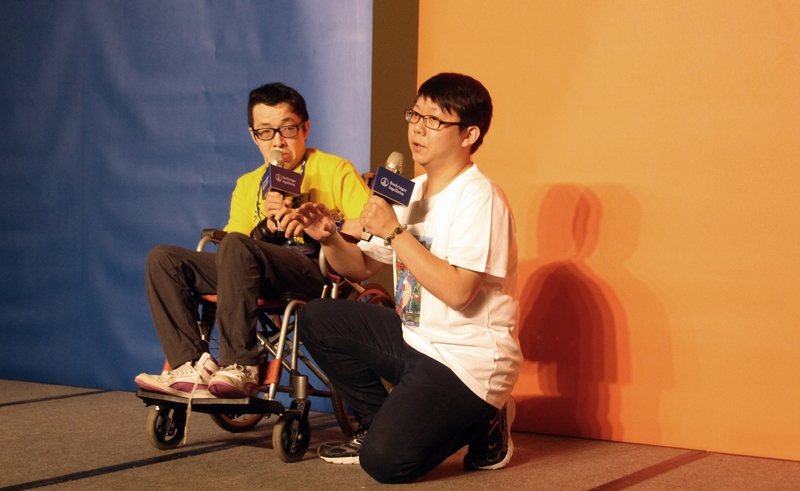 For example, Duan-Zhen has suffered from cerebral palsy since he was a small child which caused tremors in his body; every step he takes requires his full focus and energy. However, this has not stopped him from painting. A line may seem like a simple thing to draw, however, it takes Duan-Zhen to warm up and attach small sandbags to weigh down his arm in order to complete the task. Despite all this, Duan-Zhen still enjoys painting everyday and living life to the fullest. The general manager of Boehringer-Ingelheim in Taiwan, Mr. Cou Jian-Zhe, was inspired by these artists, saying that “although it takes more time and effort for them to finish their work, they never gave up.”He stated that Boehringer-Ingelheim has been founded for over 130 years with 145 affiliates across the world. Innovation--VTI Day has been established to uphold their commitment to give back to society, and it has been running for 21 years. It was a wonderful opportunity to work with disabled artists from Eden, to give insight to a different world and be inspired by their art and determination. Eden’s Xue-Xiang Huang, the director of Resource Center of North Taiwan, said that since its founding 30 years ago, Eden has been committed to helping all persons with disabilities to live their lives with confidence. Apart from offering life and career reconstruction and accessible services, we hope to build a full support network to help them regain their independence.